The magic and mystery of Beqa Island and Beqa Lagoon is captured at Lalati Resort. Romantic, all inclusive, and poised on a cobalt bay, Lalati Resort is your getaway for an all inclusive honeymoon, Fiji beach wedding, or intimate Fiji dive vacation. Throw open the front door of your private retreat each morning, to the spectacular colors of a Fijian sunrise. Sink your toes into a private sandy beach. Dip into the warm waters of Malumu Bay. Delight in the opportunity to explore every nook and cranny of Beqa’s mystical island and surrounding seas. Chase the sunset, swim with seahorses. Prepare to be totally enchanted. Exquisite and spacious, 5 private ocean front villas sit just steps back from the sea. Each villa has towering ceilings, two separate bedrooms with private entrances, polished hardwood floors and oversized lanais that make the most of the temperate tropical climate. Bedrooms are separated by a large double door, which can be open or closed for privacy. The comfortable sitting area is complete with couch, chairs and tables. Private sun decks face the sand, sea and islands beyond. Lalati’s Seaview Cottages offer guests dramatic ocean views in a relaxed and comfortable setting. The Seaview Cottages are reminiscent of charming summer homes or lakeside retreats. Bright and airy, with carefully tended gardens, the cottage interiors invite the outside in. Tropical tradewinds blow through the breezy curtains, and the spacious cottages were created to offer travelers affordable and all-inclusive Fiji Resort accommodations. Lalati’s Garden Honeymoon Villa is a tropical oasis, located on a rise behind the Oceanfront Villas and adjacent to the Seaview Cottages. The villa features blooming tropical gardens, ocean views, a large lanai and luxury Fijian-style amenities. This villa also features a complementary mini bar filled with sodas, beers and wines, replenished daily. It is approximately 100 metres from the ocean, with a romantic ambiance and special charm. Last but not least, Lalati’s only Beachfront Honeymoon Villa, is separated from the Oceanfront Villas and Seaview Cottages by its own garden of tropical flowers and orchids. The luxury villa offers unobstructed views of the sea or gardens in all directions, private lanai, large private courtyard, and an ambiance that spells romance. 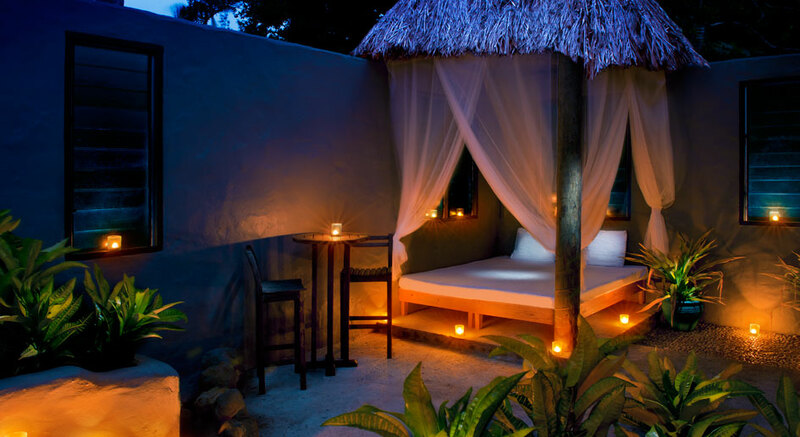 It truly is one of the most romantic settings in all of Fiji. Picture a beachfront wedding, all blues of the ocean and greens of the lush hillsides. The bride walks barefoot down a white sand beach, escorted by fierce, traditionally clad Fijian warriors. Vows are said under a bloom enshrouded arch, to the gentle lapping of the waves on the shore. With the final “I Do’s” the joyful strains of a Fijian choir serenade with traditional wedding songs. This is a wedding in paradise, Lalati-style. Fiji weddings are Lalati’s specialty. A “weddingmoon” is a great way to celebrate your love, combining the best of two worlds – an exotic destination wedding and a romantic, tropical honeymoon. Most non-motorized activities at Lalati Resort & Spa are available at no extra charge. The snorkeling and diving in the area is some of the best in the world. Children under the age of 12 years of age are not permitted at the resort, unless the entire resort is booked by a private party. Lalati Resort & Spa caters more to honeymooners and those seeking romance, with a bit of adventure on the side!